It’s no secret that in cities, particularly London, property prices are increasing exponentially, but space is not. If you are stuck in a property predicament and are struggling to use your space to its full potential, we are here to help! Our design team have been working away to create a few products specifically to maximise storage whilst minimising space. Not just suitable for a city dweller, but anyone lacking bedside space, we have created Stackers bedside pockets. 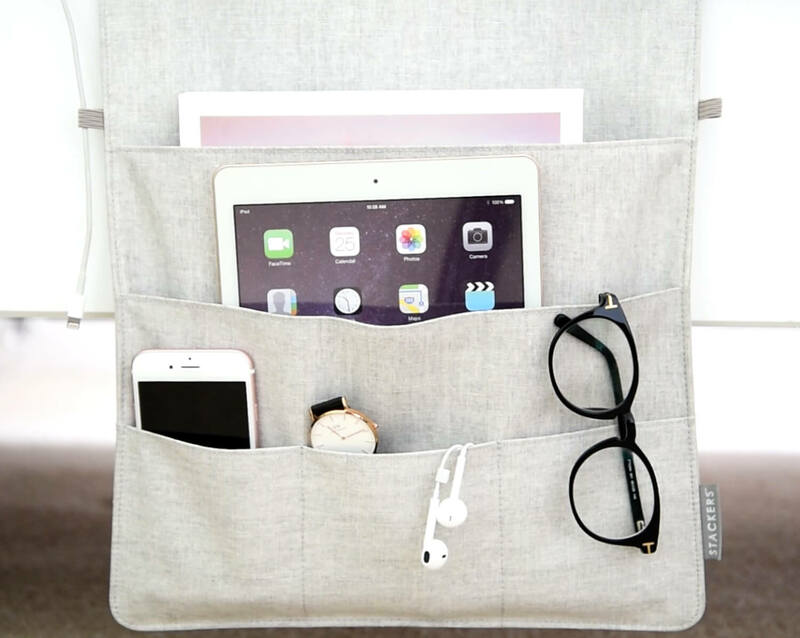 Available in two sizes, medium and large, the bedside pocket slides under your mattress and hangs over the side of the bed frame, making it extremely easy to reach, and a great place to store all of your most used items; such as your phone, tablet, book and glasses. 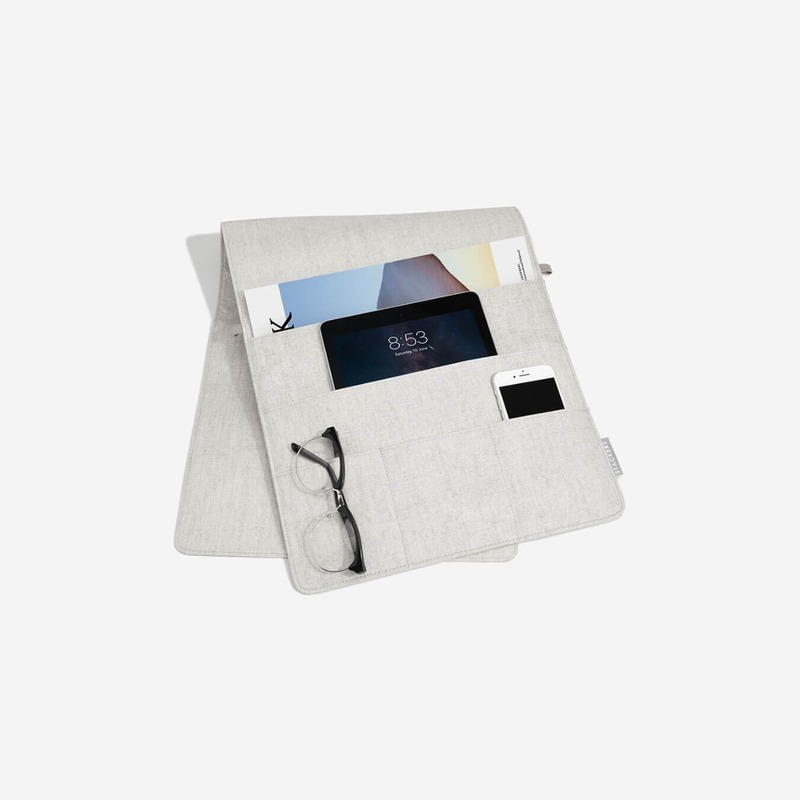 The bedside pocket also has loops down its edges to thread cables through, making sure that no wires get tangled whilst your electronics are charging in their new home. Available in a neutral grey colour, the stacker bedside pocket looks neat, stylish and suits almost any interior. It would also make a great gift for anyone who is off to University and is making the move into halls this autumn. Our second pick for those wanting more storage space is the Stacker Wrap. 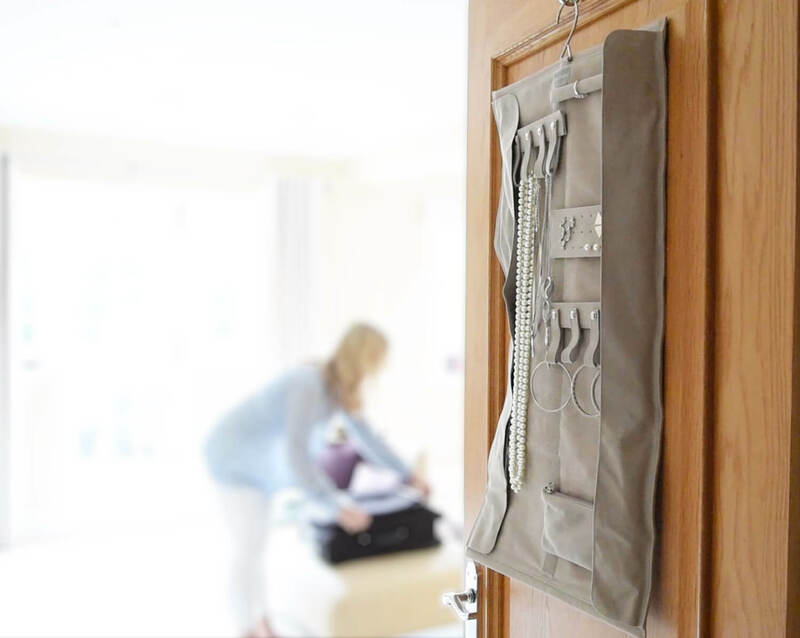 The Stacker Wrap is a large, fully customisable jewellery roll that can be can be hung almost flat on any door, including inside wardrobes. The wrap is lined either side by Velcro, meaning that any of the jewellery holders stuck to the Stacker roll can be moved around the and positioned as you wish. There are also add-on jewellery holders available that can be stuck onto the wrap to accommodate all types of jewellery collections. An added bonus of the Stacker roll is that it can be rolled up and packed easily for travelling, and with a soft velvet interior all your jewellery will be kept untangled and protected whilst you’re on the move. 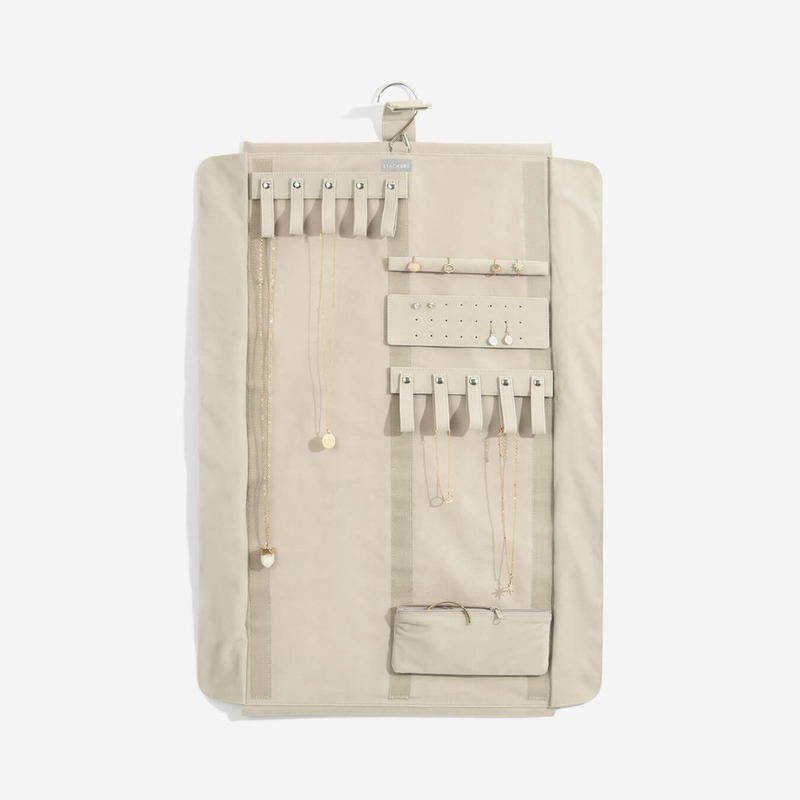 And finally, our last (but by no means least) pick is the Stackers jewellery slider. This nifty little device can be placed in a drawer and expanded using its adjustable sides. It comes in a medium and a large size, meaning it can fit almost any size drawer. 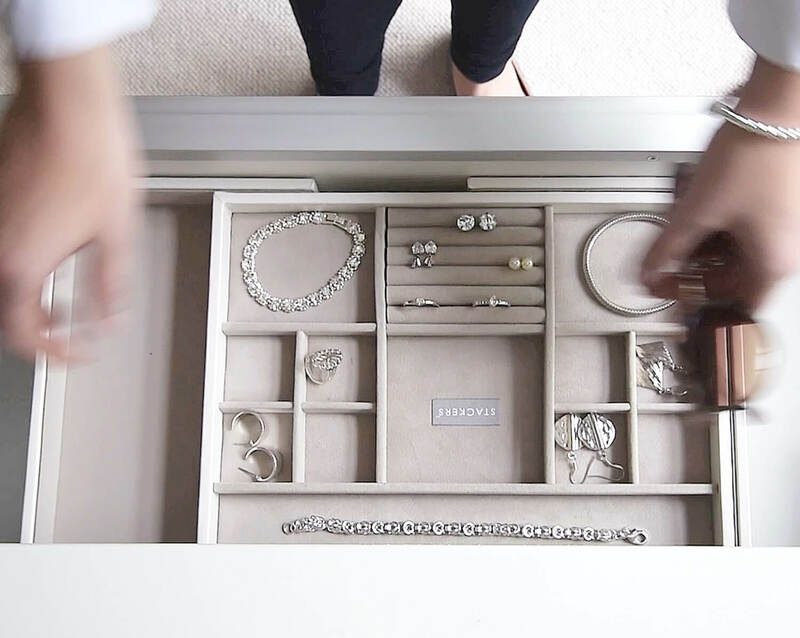 The jewellery slider provides a prefect place to store and organise all of your jewellery without taking up extra surface space on your bedside table or dresser. To purchase any of the products mentioned in this post, follow the links on the right hand side!